Archaeological Map of the Czech Republic. Current state and future visions of virtual research tools in the Czech Republic. Kuna et al. Internet Archaeol. 43. The nationwide systematic registering of archaeological sites began in the Czech Republic (CR) soon after the founding of independent Czechoslovakia. The State Institute of Archaeology was established in November 1919 as an independent institution controlled by the Ministry of Education. It was separated from organisations dealing with other types of cultural monuments, and its main task was the systematic study of prehistory, the overall coordination of archaeological fieldwork and the widely conceived collection of information regarding archaeological finds in the territory of the Czechoslovak state (cf. Niederle 1919). Explicitly, the tasks of the former State Institute of Archaeology were determined by its statutes, the oldest known version of which, however, dates to the year 1931. The new organisation was defined as an institution with the above-mentioned functions; the first task mentioned in the statutes was to 'develop a complete list of prehistoric finds in Czechoslovakia'. This duty was gradually accomplished by the efforts of its staff (with approximately a dozen professionals – archaeologists in the inter-war period) and by collecting data from a wide network of external collaborators from several categories – conservators, agents and correspondents. From these resources the Institute began to develop an extensive archive, including documentation of fieldwork, various reports on finds, excerpts from scientific literature, information obtained by questionnaires in schools, lists of museum collections, etc. The resulting collection of information is still preserved in the archives of the Institutes of Archaeology in Prague and Brno – the legal successors to the former State Institute of Archaeology. In 1952, the State Institute of Archaeology was incorporated into the newly established Czechoslovak Academy of Sciences (CsAS). The Institute of Archaeology of the CsAS in Prague, with a branch in Brno (operating since 1970 as an independent institute) and the corresponding institute of the Slovak Academy of Sciences in Nitra became in the post-war period vast institutions with a number of central functions. The Institutes of Archaeology CsAS employed the majority of professional archaeologists in the country (e.g. in the late 1980s, the Institute in Prague alone employed around 200 people). They represented the only organisations legally authorised to conduct archaeological fieldwork, provided opinions on permits for other organisations (after 1987; prior to that date they had directly authorised them), supervised the quality of scientific activities, organised conferences and published the main professional publications and journals. In the socialist state, scientific research was centrally planned and the institutes of the CsAS were expected to provide results in the form of extensive fieldwork, representative publications and theoretical knowledge. Within such a system for the organisation of work, the systematic evidence of archaeological heritage was of secondary importance. The majority of archaeological work was focused on disproportionately extensive excavations at unthreatened sites and on the description of historical processes from the viewpoint of the culture-historical paradigm and the principles of Marxism-Leninism. Often, even the main archaeological fieldwork was not sufficiently processed, and large institutions paid only marginal attention to other research methods such as field surveys, small-scale rescue excavations, etc. Paradoxically, Czech archaeology lost even more of its ability to maintain a reasonable overview of the ongoing fieldwork in Bohemia after the year 1989 and the following social changes. The role of the Institutes of Archaeology of the Czech Academy of Sciences in Prague and Brno (IAP, IAB; the name of the Academy changed to the Czech Academy of Sciences, CAS, after the break-up of Czechoslovakia in 1993) was reduced and they essentially lost their privileged position. In the course of the liberalisation of society, dozens of new archaeological organisations that quite easily obtained licences to conduct archaeological fieldwork were established. The Institutes of Archaeology CAS, which in principle should still have supervised the quality of archaeological fieldwork, did not receive any financial support for providing this service, and therefore their supervision became a more or less formal matter. The activities of state heritage management organisations developed along with the activities of the CAS institutions in the post-war period. These organisations were also the successors to those from the pre-World War II period, but dealt exclusively with registered cultural monuments, very few of which were archaeological sites. This fact corresponded to the rather small number of archaeologists employed in these institutions, with the exception of the Prague Office of the Heritage Institute which (under changing names) has conducted numerous field excavations in the historical centre of the capital of Prague since the 1960s. The situation changed only in the mid-1990s, when the State Institute for Monument Preservation began to build its own evidence of archaeological monuments (the State Archaeological List of the CR, see below), and for this purpose the number of archaeologists was increased. This activity continued in the successor organisation – the National Heritage Institute (NHI), which was founded on 1 January 2003. The NHI currently has 19 regional offices, the majority of which are licensed to conduct archaeological fieldwork. The State Archaeological List of the CR (better known under its Czech abbreviation 'SAS') is administered by the Department of Archaeology of the Directorate-General of the NHI. It is important to mention that neither the Institutes of the CAS nor the departments of the NHI have been entrusted with executive power in the Czech legal system – this belongs exclusively to the authorities of state administration and local governments (which, however, never employ archaeologists). Currently, in addition to the two institutes of the CAS and the regional offices of the NHI, there are 104 other organisations licensed to conduct archaeological fieldwork in the CR. This group includes 82 museums, 7 universities and 17 archaeological units. Unlike public institutions such as museums and universities, archaeological units mostly represent private companies, and their main aim usually is carrying out the so-called commercial archaeology (even though, according to the Act, archaeology ranks among mandatory non-profit activities). Legal regulations covering archaeological activities do not impose the obligation to centrally record archaeological sites and fieldwork on any subject. The still valid Act from 1987 only states that obtaining authorisation for fieldwork is conditional on an agreement with the Czech Academy of Sciences. These agreements usually contain a requirement for the licensed organisation to transmit basic information on its field activities to the central archive; however, in practice the ability to enforce these agreements is limited. In creating their databases, the Institutes of Archaeology can rely on a wealth of documents accumulated in their archives of field documentation over the 90 years or more of their existence. The saved document collections consist of 'excavation reports' on their own field activities as well as reports sent by other organisations in the CR. In the case of their own excavations, the Institutes´ archives also include other field documentation (photos, maps, plans). In addition to the above-mentioned documents, the archives keep a large number of other documents such as expert reports, correspondence, reports on accidental finds, etc. The documents themselves are classified and stored according to geographical aspects (cadastres). In 1963 the IAP began to publish Excavations in Bohemia (the first five years as the Bulletin of the Rescue Department). In this publication, archaeologists heading individual excavations gave brief structured reports on the results of the fieldwork they had conducted in the previous year. The first attempt at an electronic national archaeological database was the Archaeological Database of Bohemia (ADB), which has been administered by the IAP since 1990 (Kuna 1991; 1994; 2002). The ADB records are structured according to 'archaeological events' ('fieldwork events' in terms of the AMCR; Figure 1), i.e. individual excavations or other field activities. In this way, the database records analytical data, i.e. information arranged in the order in which it was collected, and it does not combine the data into larger units derived from primary evidence. From a theoretical point of view, the ADB authors were influenced by the settlement areas theory (Neustupný 1986) as well as by British landscape archaeology, especially by the idea of the continuous occurrence of archaeological traces in the landscape and the impossibility of their meaningful division into objective spatial units ('sites', e.g. Gaffney and Tingle 1984; Kuna 2002). At the present time, we firmly believe in the correctness of this approach. In total, 102,000 reports on archaeological events were accumulated in the ADB over 25 years of database operation (until 2013). Analogous data for Moravia and Silesia have been collected by the Institute of Archaeology in Brno (IAB) since its founding in 1942. The Prague approach has been used in Brno for data collection since the 1990s, and since 2007 the data have been kept in a computer database. 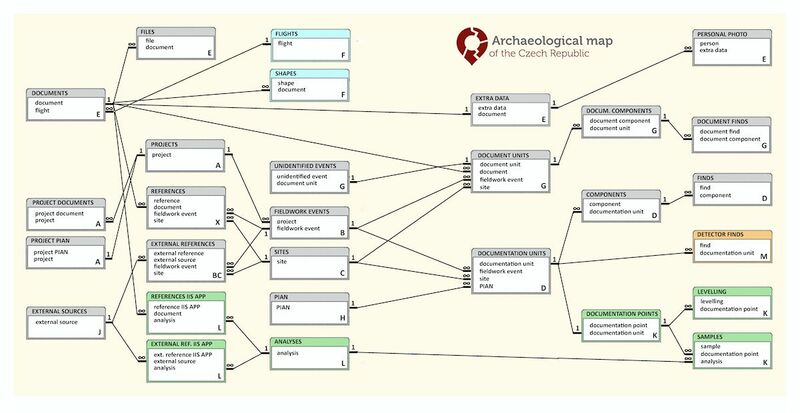 In 2009, the information system entitled Digital Archive and Records of Archaeological Fieldwork in Moravia and Silesia was created using the Prague database structure as well as its glossaries. Two years later, the Institute in Brno agreed to the implementation of the Internet Database of Archaeological Fieldwork (IDAF) in the regions of Moravia and Silesia. Currently, the system contains about 5,000 records on archaeological events and 15,000 documents. Gradual work on the retrospective revision of ADB data was interrupted by the flooding of Prague in August 2002.The library (with approximately 100,000 volumes) was almost completely destroyed by the flood, but since then it has grown again to about 40,000 publications, naturally with the kind assistance of other Czech and foreign institutions. After 2002, as part of the restoration process, a new library catalogue and the Analytical Bibliography of Czech Archaeology were converted to electronic form and are now accessible on the Institute's website. The latter database contains approximately 100,000 bibliographical records on publications either written by Czech authors or dealing with Czech topics. Within the AMCR project, these databases were included in the AMCR information system and form an important auxiliary set of information. As a way to save the damaged archives and to prevent any future loss of information, a decision was made to digitise all of the IAP archive documents. The digitisation programme was completed around 2010 and the AMCR project was launched in 2012, following by the 'sites and monuments records' more or less from the same point where it was prior to the flood. To this day, all documents in the IAP archives have not only been digitised but also described by detailed metadata, and, thus, have become an important segment of the information system of the AMCR. The fully digitised content of the archive represents a collection of more than 300,000 documents. The process to digitise field documentation is also underway with the Digital Archive of the IAB in Brno. Currently, about one-third of the total of c.150,000 visual documents (negatives, positives, photographs and posters) have been digitised along with about one-half of 60,000 text documents (reports, excavation reports, estate documents and clippings). The greatest challenge all evidence systems have had to face in recent decades was the lack of systematic information on the preparation and progress (or rather the very occurrence) of individual fieldwork in the country. In these conditions, it was virtually impossible to control the quality of either the fieldwork itself or the resulting excavation reports. This problem was largely solved only by launching the Internet Database of Archaeological Fieldwork (IDAF) in 2008. The IDAF system operates as a register of prepared and ongoing fieldwork and a large majority of all licensed organisations in the CR are involved (though it is still voluntary) in the entry of data. In mid-2015, the database included about 45,000 records that can be linked to data on individual fieldwork events in the ADB, although, as far as technical parameters are concerned, they represent two separate systems. Besides the content of the database systems that are largely related to the administrative agenda, IAP and IAB records a certain number of 'sites', i.e. units that are not directly tied to any of the records on specific fieldwork. They represent archaeological monuments visible on the surface that have been, in the long term, recorded on different lists compiled in the course of surface surveys (such as prehistoric and early medieval hillforts, medieval castles, deserted villages etc.). A completely separate group of sites was identified by aerial survey based on surface cropmarks (soil marks, etc.). In the last 20 years, approximately 700 sites of this type have been identified in Bohemia by IAP aerial survey. Currently, the AMCR is in the closed testing phase and it will be fully functional in 2017. Since 2016, the AMCR (as a part of the Archaeological Information System of the CR – AIS CR) has been accepted into the Roadmap of Large Infrastructures for Research, Experimental Development and Innovation of the Czech Republic for the years 2016–2022. This ensures sufficient long-term support for the day-to-day work, an increased public interest and funding of development and new possibilities for further integration into the professional environment. The AMCR system has the potential to overcome the current fragmentation of professional archaeological infrastructures in the country. The unification (established by the AMCR project) of the database systems of the IAP and IAB represents a crucial step toward the creation of a unified information infrastructure for the whole country. The unification will enable more rapid completion of the digitisation and re-examination of Moravian records, higher overall system efficiency and an increase in the real significance and prestige of archaeological infrastructures in the sphere of the Digital Humanities. The AMCR project represents the culmination of the medium- as well as long-term efforts of the IAP and its partner organisations. It integrates two basic aspects of archaeological heritage management. On the one hand, it represents a branch administrative system to ensure ongoing administrative evidence of upcoming as well as ongoing fieldwork. This enables the effective control of their quality and the subsequent processing of results into the final excavation report. In this case, the system works primarily with data coming from developers, cultural heritage managers and archaeologists – heads of archaeological excavations, who are mandated to provide information to the central database. On the other hand, the AMCR aspires to present a comprehensive overview of the archaeological heritage of the CR, and, thus, to create a 'national' archaeological database of the 'sites and monuments record' type. There are two main information sources – the data on recent fieldwork events, and the data on past fieldwork collected retrospectively. Besides the factual level, the AMCR plays an integrating role in several other areas. We have managed to implement the AMCR system not only in the activities of the IAP, responsible for Bohemia, but also in the IAB managing the data from Moravia and Silesia. Thus, for the first time in Czech archaeology the entire CR has been integrated within a single strategy of archaeological fieldwork evidence. 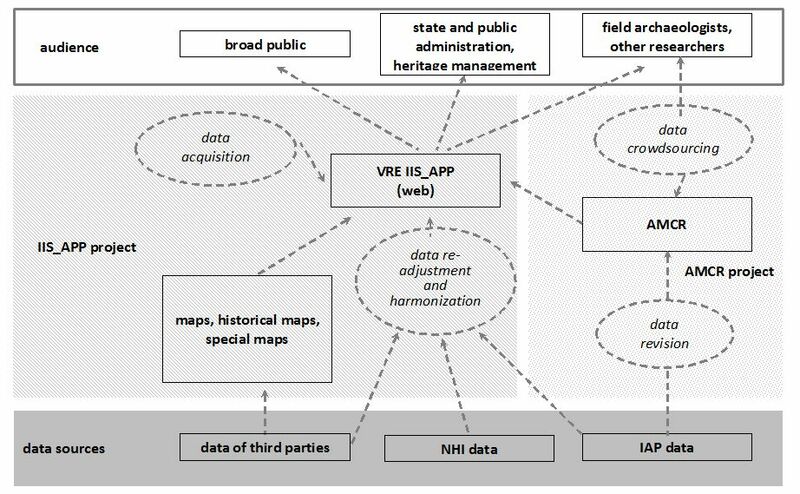 The third integration level is represented by the harmonisation of two parallel systems of evidence that were created with different objectives in the two major professional institutions of the CR, namely the AMCR and the State Archaeological List of the CR (SAL) administered by the National Heritage Institute (NHI). Within the scope of the AMCR project, we have managed to ensure that the data in both systems will be updated simultaneously and, therefore, professional capacities will be saved for data entry. The last integration level represents the gradual creation of a co-operative professional community. Archaeologists and those interested in archaeology are still insufficiently aware of the importance of co-operation in the development of research infrastructures; however, archaeology can hardly move forward without their existence. Thus, the AMCR also aims at contributing to the creation of a community that is aware of its responsibility for building professional infrastructures and is able to participate in their creation. The AMCR project has also been successful in establishing a relationship between the AMCR and the parallel IIS ASP project (also conducted by the IAP). 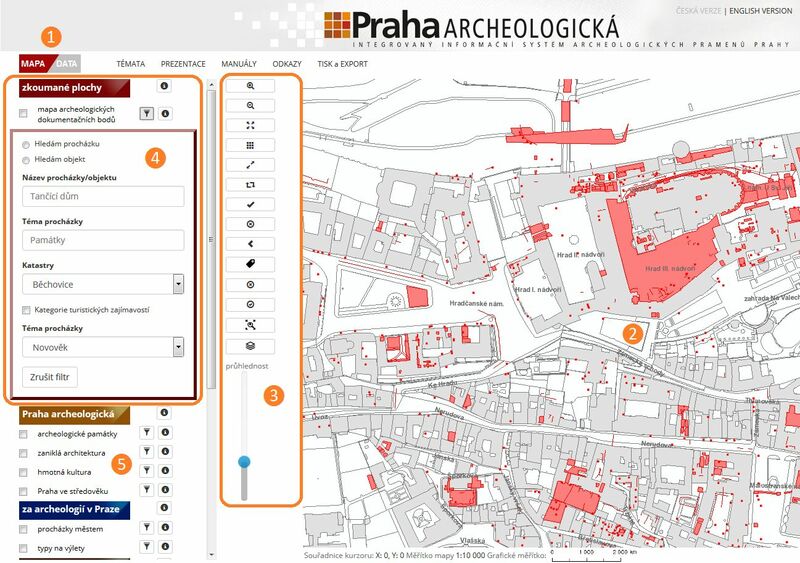 This project focuses on the comprehensive processing of the archaeological finds of the historical centre of Prague. The project methodology can be used, however, to map any other areas with complex archaeological contexts. We succeeded in adjusting the relationship between both systems in a way that ensures that IIS ASP records grow organically from the AMCR data. On the other hand, the IIS ASP provides a more detailed description of the documentation units (e.g. individual trenches) while keeping the basic principles of the AMCR. The AMCR information system seeks to bring together previously unconnected databases and operations related to their performance and management: (1) administrative evidence of upcoming and ongoing fieldwork; (2) collecting information on the scientific results of archaeological fieldwork; (3) systematic recording of other sites in the landscape known primarily from long-term surface survey and remote sensing; and (4) management of the field documentation repository for the use of the IAP and IAB, as well as other institutions within the framework of the current legislation. The system is based on a dynamic model of archaeological (field) research as a way of obtaining specialised knowledge. 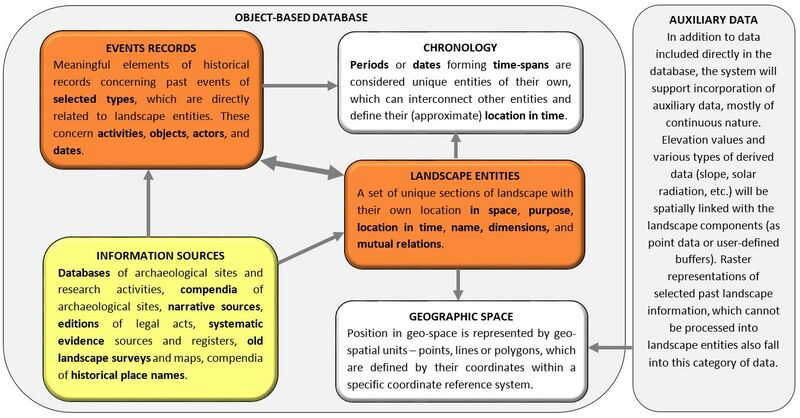 Archaeological fieldwork typically goes through several phases, and each of them uses specific terms and categories (Figure 2). 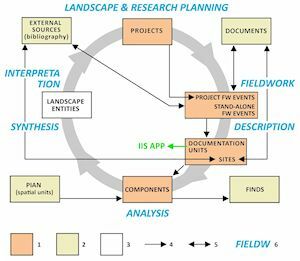 It starts with formulation of professional goals and spatial planning (1), continues with fieldwork (2), functional and chronological analysis of the excavated archaeological context (3), and ends in data synthesis and interpretation (4). After the synthesis phase is reached, new research questions may be asked, and the next iteration of the cognitive cycle emerges. Therefore, the AMCR data model and workflows are set up so that the dynamic character of the data flow can be reliably captured. The above-mentioned phases of the cognitive process correspond to the categories of the archaeological evidence units used (or proposed) in the AMCR: (1) projects; (2) fieldwork events and sites; (3) components; and (4) landscape entities. In addition to these categories, there are another four important groups of data that the AMCR uses for detailed specification of the form and content of the preceding categories. These 'reference data classes' are (5) finds, i.e. data on features and portable items discovered by fieldwork and used for the further specification of their particular components; (6) spatial units (in Czech 'PIAN'); (7) metadata on the field documentation linked to fieldwork events (documents) as well as (8) bibliographic records understood as external information sources. When the project was launched, the ADB contained approximately 94,000 records on archaeological fieldwork and finds in Bohemia from the 19th century to the present day. These data were, however, burdened with a particularly high number of duplications and inaccurate spatial definitions of the fieldwork. Within the scope of the revision (carried out by the AMCR project), duplicate records were identified and removed and their contents were merged into authority entries, spatial data were revised and modified into an authority file of the PIAN units, and records of the 'site' type were transferred to the 'Sites' data class. Several dozen experts were externally employed in order to revise the data file. The experts mainly came from regional institutions because they were highly familiar with the state of evidence and resources in their regions. The IAP staff established a model to be applied to the revision process, including preliminary semi-automatic identification of duplicates, the conversion of records into a text editor, data processing by external collaborators, the creation of new spatial units and re-entering the corrected data in the ADB (AMCR) database. After the revision, the number of authority records of events decreased in the AMCR by 25%. On the other hand, the number of spatial units increased by 5%. However, a certain part of the records (less than 1%) was left unedited, and these records need to be revised in co-operation with the broader scientific community in the future. The revision of the ADB/AMCR concerned, of course, only what was available in the database, and there is still some knowledge that never found its way there. Missing data on fieldwork events (those done in the field but never reported to the offices of the IAP and IAB in the past decades) remains the major imperfection of the AMCR system. Unfortunately, the number of such events may be rather high; it can cover up to 30-50% of all archaeological activities in the country. It was impossible to simultaneously collect these data, create the system and revise the existing records. However, the systematic collection of such data is anticipated in the future and the AMCR system may include some crowdsourcing principles, which may become an appropriate tool to achieve such a goal. Widely constructed research infrastructures contain significantly more potential to enhance integration of the 'national' archaeological community than any other segment of archaeology, even if such a path will not be easy in the CR. The task of building an infrastructure implies not only setting its technical foundations but also filling it with data, which is more difficult. Owing to funding restrictions, such a task is currently feasible only with the voluntary co-operation of many experts and organisations. In the CR, submitting data to central databases is not a very popular obligation because it is time consuming, hampered by the effects of competition, and not every expert is aware of its real meaning. The majority of professional archaeologists are not only reluctant to share their own data, but also have little interest in broader research topics based on extensive research infrastructures. Therefore, the small supply is evidently related to a rather limited demand. It is obvious that changes in attitude can only be achieved by multiple activities; however, the creation of the AMCR infrastructure can be regarded as an indispensable step towards such a change. The AMCR system can reach the community of archaeologists in the CR in particular by integrating the registration of fieldwork with the submission of information on results, by the gradual completion and presentation of information about the archaeological heritage of the CR, and by providing online access to the largest specialised document repositories in the CR. The AMCR not only provides the data for users, it also gathers them. The system simultaneously collects 'mandatory' administrative data for the evidence of field interventions and offers 'voluntary' co-operation in the creation of an information base. There is so much older information on archaeological finds and fieldwork that is not yet registered that their collection and an overall revision cannot be performed by a single institution. The AMCR represents an attempt to use a kind of professional crowdsourcing to create the collective knowledge of the archaeological community. By using the AMCR we can jointly edit information about previous archaeological fieldwork as well as input information regarding events that have not yet been registered. This task is not an obligation required by the law, but a voluntary sharing of information by individuals and organisations. Together, they create the most significant information source and intellectual property – a relatively complete and reliable overview of the national archaeological heritage. The AMCR establishes open and democratic access to specialised (archaeological) information, and this act can be characterised in Czech archaeology as a novelty. The openness cannot be, for good reasons, absolute. Therefore, several user roles are distinguished within the AMCR system, with different sets of working rights within the system. With regard to current field activities, the AMCR will probably be able to rely on the new Heritage Act, but the processing of older data will primarily depend on the entire scientific community and on whether archaeologists will deem this task worthy of their attention and efforts. The AMCR team working in the IAP and IAB will, naturally, create the necessary conditions for such a task: the dissemination of knowledge, training of users, the creation and dissemination of best practice manuals, etc. Altogether, five user roles with different sets of working rights within the information system are distinguished in the AMCR. At the basic level, the right to browse the information system can be obtained by anyone by installing the software on their computer (role 'A' – 'anonymous user'). The act of registration ensures extended user rights (role 'B' – 'researcher'). Additional rights can be granted to specialists employed by organisations licensed to conduct archaeological fieldwork (role 'C' – 'archaeologist'). 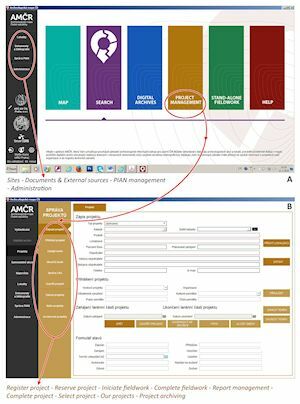 Employees of organisations engaged in the AMCR system management can obtain user rights 'D' ('archivist', mainly conducting formal and content control of entered records) and 'E' ('administrator'), who manages the entire system. Without exceptions, the rights derived from user roles are cumulative, i.e. each higher role also includes the appropriate permission given to lower levels. User roles are always tied to a specific user account, and organisations may be represented in the system by users on different authority (role) levels. The user roles affect the extent of access to data and functionalities. Generally speaking, archived data (i.e. closed and checked records) are available to all users for browsing (to the extent permitted by the Copyright Act), with the exception of data for which the record author or the administrator indicates a risk of abuse (e.g. aerial photographs showing the position of new sites endangered by illegal activities). Only registered users ('B' or higher user role) can create new records and enter new documents. The Graphical User Interface (GUI) of the AMCR software is divided into several basic tools (procedures for browsing, extracting and exporting the contained data) and workflows (processes for entering and managing the data). For the sake of orientation, the user interfaces of major tools and workflows are distinguished by different colours of the GUI features and background (Figure 3). Individual workflow steps follow as closely as possible the real course of the collection and management of archaeological data within the framework of a dynamic model (see above). 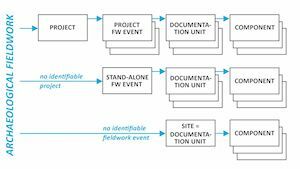 Moreover, it is usually the user who inputs new information and decides whether the particular segment of fieldwork activity was described enough to move it forward to the next process state. The GUI and the application behaviour focuses on three basic objectives: (1) to convert existing procedures for managing archaeological field activities into a coherent administrative system; (2) to create individual workflow components on the basis of repeating forms in order to make the system easy to use; and (3) to minimise the risk of possible missteps. Workflows for harvesting the database, i.e. the Map and the Search modules, also stem from the needs of the scientific community. An emphasis was put on the flexibility of the application and the maximum comprehensibility of the results (exports, printed reports, etc.). The AMCR application can be described as an interconnected system of several segments (groups of tables, data categories and glossaries) related to the functions of the information system. Some segments are completely integrated (e.g. components within the fieldwork events), others form more loosely connected modules standing on the system's periphery (e.g. shared data classes of the IIS ASP, etc.). The AMCR segments (in Figure 4 marked by colours and the letters A-M, also used in the following text) consist of (A) records on planned field interventions (projects); (B) records on fieldwork events (both project and stand-alone events); (C) records on sites; (D) the scientific description/contents of fieldwork events and sites (components); (E) metadata on the form, origin, authorship and preservation of the field documents in the IAP and IAB repositories, including (F) the Archive of Aerial Photographs; and (G) metadata on the contents of documents (document components). These segments are logically linked to auxiliary information such as (H) spatial units (PIAN), and (J) the catalogue of bibliographic references (external sources). 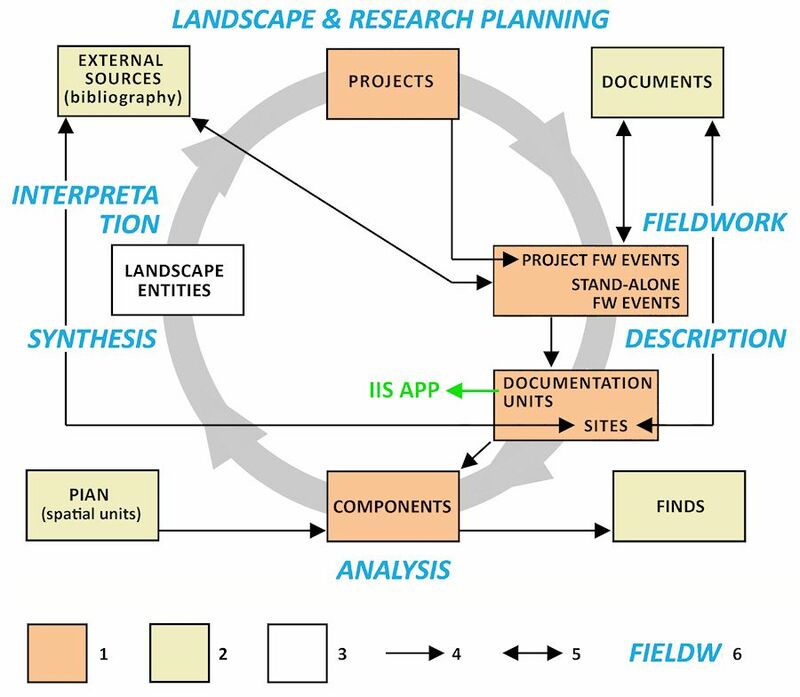 The detailed description of the documentation units (K – the IIS ASP module) was developed in a separate project (Figures 5 and 6). The system can be further extended by (L) the evidence of scientific analyses (also in the IIS ASP module), and (M) the evidence of finds obtained by metal-detector surveys (under development). The AMCR system is designed in such a way that most elements are separate database objects. For example, the location of fieldwork events and their links to bibliographical references are not recorded as 'properties' of the fieldwork event record, but as relationships between objects of separate classes that establish mutual links, usually of the 1:N or N:N type. Thus, a single event can be linked to an unlimited number of bibliographical records, and, at the same time, the same bibliographical reference can be linked to other events or sites. A concept of this type takes full advantage of the relational database, but is, simultaneously, also very close to object-orientated data models that further deepen the data class breakdown into the basic entities. Moreover, it fulfils the need to create authority entries of various data classes. AMCR data are largely structured by standardised glossaries (controlled vocabularies). Glossaries define the relevant level of details, facilitate the recording of typical information, enable searching and allow the data to be machine-analysed and connected with other systems. Moreover, the glossaries also ensure the general use of consistent terminology, which leads to better orientation in the data. Glossary entries contained in the AMCR stem from their predecessors used in the ADB (Kuna and Křivánková 2006). The system of keywords is based on standard archaeological terminology (see Table 1) and includes entries that are, according to the existing data analyses, more frequently attested. The AMCR generally prefers locked glossaries, where the addition of new entries is possible only in justified cases and after consultation with the system administrator. The AMCR glossaries form the basis of a consistent branch terminology used in fieldwork practice in the CR. The main goal of the AMCR is to create a uniform and sustainable system for the evidence of archaeological fieldwork events, their results and related information sources. Therefore, the majority of the data classes must contain unique and persistent identifiers (PIDs) of the records. Such identifiers (IDs) are, within the AMCR system, assigned to all new entries as well as retrospectively to all imported existing data after the control of their validity. The AMCR identifiers are derived from the IDs of the projects and stand-alone fieldwork events. Such IDs should accompany records in all their evidence stages and represent an element that unambiguously links scientific databases, fieldwork management, relevant documents, publications, and last, but not least, finds in museum collections. 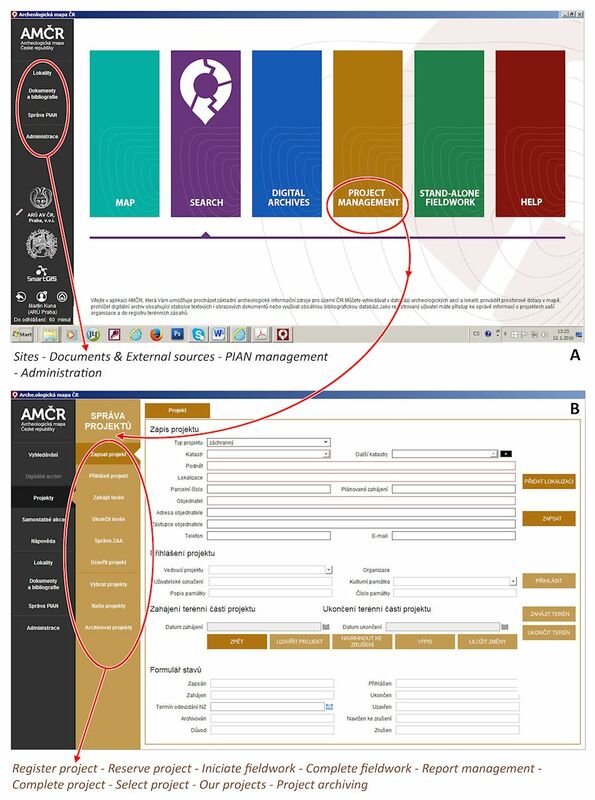 Unique IDs can be created only if there are lists of authority entries (authority files) of the given data classes; their creation was among the main objectives of the AMCR project. When designing the IDs, attention was paid to their logical nature, and, to a certain degree, comprehensible form. For example, every ID indicates the spatial localisation of the data (C – Bohemia/Čechy; M – Moravia) and the kind of data class they belong to, etc. Wherever possible, the preceding system of identification has been preserved, since many entries may already be in circulation in the scientific literature, although sometimes it was necessary to modify its format. The system distinguishes between permanent and temporary IDs. Permanent IDs are assigned at that stage in the process when the record is expected to become stable; the removal of invalid identifiers can cause unnecessary gaps. Therefore, permanent identifiers are assigned to fieldwork events only after submitting the record for validation. All records can be also imported into the system in batches, with permanent IDs already assigned outside the system. Within the structure of archaeology, specialised archives retain an irreplaceable position. The original archaeological contexts are usually destroyed in the course of archaeological fieldwork and, thus, the field documentation in archives (and portable finds in museums) represents the primary source for further research. In Czech terminology, the term 'archaeological archive' includes only field documentation, while in many other European countries it includes both documents and portable finds discovered during excavations (Brown 2007). Nevertheless, it is important that both of these parts of the 'archaeological fund' (cf. Perrin et al. 2014, Czech translation) are regarded as indispensable, and if links between them are lost, the archaeological information loses most of its value. Thus, even though the documentation and finds are physically separated in the current system of heritage management in the Czech Republic (documentation stays in 'archives' while finds go to museums), it is necessary to preserve all mutual links between these two parts of the holding. While the significance of museum finds is commonly acknowledged, the archaeological fieldwork documentation is not legally protected at all and the public is hardly aware of its relevance. This further emphasises the need for a responsible approach towards creating and maintaining 'archives' by individual archaeological institutions and the importance of central ('national') archives existing in the Institutes of Archaeology. As far as archiving data is concerned, archaeology currently stands at the crossroads, and we have to admit that for the majority of archaeologists the decision to abandon analogue data completely is still difficult. Principles for acquiring digital data as well as their aftercare must be defined to ensure their general acceptance by the archaeological community. Based on past experience, we can argue that the archiving of digital data represents a task far more complex and costly than the archiving of analogue data. The possibilities of disseminating and harvesting digital data are so desirable and promising, that there is no other obvious solution than to allocate considerable resources to data digitisation and the on-going care for their preservation. The IAP Archives digitisation programme was launched immediately after the 2002 flood and was more or less completed in the year 2011. It pursued three main objectives: (1) to save the contents of the documents that were damaged by floods; (2) to pre-emptively protect archive content from another similar event that could occur in the future; and (3) to facilitate the information flow in Czech archaeology. Since around 2007, documents are submitted to archive primarily in digital form. The IAP Digital Archive is one of the pillars of the archaeological information system, the creation of which represents a long-term endeavour in the IAP. Although the Internet application of the Digital Archive is currently fully functional and filled with data, it appears to be advantageous to convert it into the new unified platform of the AMCR. To state just a few reasons for this conversion: the technical maintenance of the information system will be markedly cheaper, user interface will be updated to new standards, and the new system will be implemented according to the current best practice – using Open Source solutions, providing persistent URIs and maximising data accessibility. Regarding the transition to a new environment, two tasks become important: document indexing and the creation of links between objects of the document type and fieldwork projects, events and sites. Generally, this is a more difficult task than the actual digitisation of documents; however, most of it has been achieved within the AMCR project. 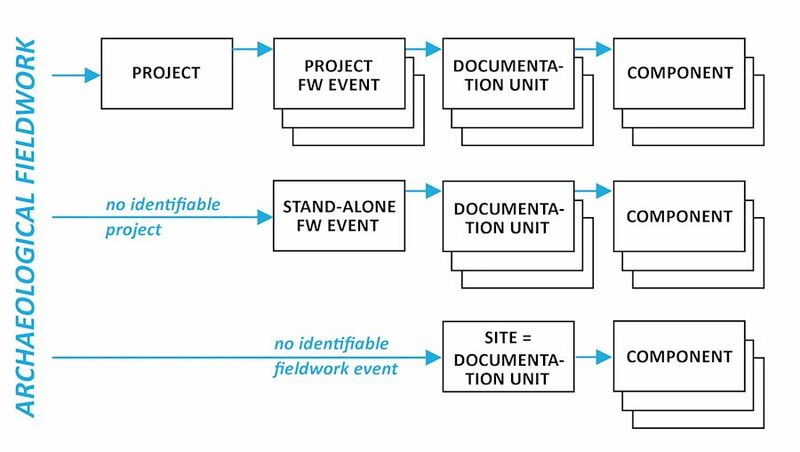 The creation of links between documents and field projects/events is a current challenge for archive management. The identification of these links has already been partially accomplished within the AMCR project but, in general, this task remains to be solved in the future. For example, 9,000 of the total of about 70,000 excavation reports can be automatically connected to a specific fieldwork event, and in 17,000 cases the link needs to be revised. The remaining documents possess no (known) relationship to the particular events (although, logically, they should have one), and it will therefore be necessary to trace these links by analysing their contents by the AMCR staff. Although data from the AMCR are still incomplete and unrevised in all details, they have considerable potential for the reconstruction of the overall settlement development of the country (Figure 7). Just to mention several specific topics: the process of colonisation and re-abandonment of various parts of Bohemia and its causes, relationships between the settlement distribution and the environmental characteristics of the territory, population density development, patterns of settlement networks and the possible links to their sudden changes to migrations or environmental crises. Previous attempts to use the AMCR data in this way have been of a rather preliminary nature (e.g. Kuna et al. 2007, 128; Dreslerová et al. 2016; Pokorný 2011, 245-51), but recently published studies have addressed the above-mentioned topics systematically and applied various sophisticated methods (Dreslerová 2011; Dreslerová and Demján 2015; Demján and Dreslerová 2016; Kolář et al. 2015). They were stimulated, in particular, by growing environmental research (e.g. evaluation of pollen profiles from various parts of the settlement zone), and the effort to compare its conclusions with archaeological models. Moreover, new approaches to processing large series of radiocarbon dates (Shennan et al. 2013) and their expected contribution to our understanding of prehistoric demographic trends have also contributed to the intensification of research activities in this field. the number of settlement units simultaneously existing in the given area and time span, i.e. the number of prehistoric community areas, medieval villages, central places, seats of social elite, etc. We can, therefore, assume that a strictly empirical approach to data from the common 'sites and monuments record' type cannot lead to success. On the empirical level, i.e. in the form in which data are primarily received and recorded, the data structure is distorted with an unacceptably high error that can hardly be removed by any statistics. Expectations that should the data be sufficiently abundant, then they will be reliable and representative are probably wrong. As long as the quantity of archaeological components or finds is applied as the major criterion, the situation cannot improve, and the increasing size of the data sample would only confirm the systematic data distortion. Therefore, the solution does not lie in methodology itself (e.g. more sophisticated statistical methods), but in a proper theoretical framework. A shift in the theory of archaeology rather than its methodology can be seen as a key point of departure for the future. It is necessary to develop the theory of past settlement processes and to learn about their quantitative aspects in the context of formative processes. Obviously, in this respect archaeologists have to navigate between two monsters – between the 'Scylla' of generalising models that do not say anything new, and the 'Charybdis' of empiricism that overwhelms us with a quantity of data without any chance of understanding them. Czech society treats its archaeological sites worse than they deserve and in a manner that falls short of what is required in terms of running a modern society. Even archaeologists failed to treat their monuments well. To overcome this situation, it is necessary not only to provide information about selected archaeological sites but also to bring people to the landscape, to show them what the archaeological remains look like and how they can make sense to a visitor. This is the aim of the Archaeological Atlas of Bohemia (Figure 8; Kuna et al. 2014/2015) – a book and a website. 'To embody a piece of archaeologist in every reader' may be a somewhat exaggerated wording from the book's introduction, but in principle it describes our intention quite precisely. In individual structured chapters, the Atlas contains basic information about the importance and history of the selected sites, the archaeological fieldwork undertaken as well as the interesting finds unearthed there (Figure 9). The authors, however, tried hard to ensure that the reader not only gains this information about specific sites, but also as a reference to more general characteristics of the archaeological record in the landscape and the different ways in which such knowledge can be found, understood and explained. In this article, we would like to mention two principles behind the Archaeological Atlas that so far are not so common in the scientific or popular literature. One of them is the considerable degree of openness to the public. The Atlas provides the public accurate information about a part of the cultural heritage, and this may, in some cases, foster concerns about their possible misuse. Anyway, it should be stressed here that this openness is intentional. Although there is, in our opinion, archaeological information that should not be disclosed, either now or in the future, their incidence is so small that they do not concern a publication of our type. Everything else can and even should be published, because it represents information obtained using public funds and, thus, the public is entitled to it. There is another reason for the openness. As mentioned above, the threat of damage to archaeological sites in the CR is currently extensive and often intense. Sometimes the damage is intentional, as in the case of metal-detector users, sometimes it is merely the result of ignorance. In our opinion, both cases can be cured by only one remedy – information. The tens of thousands of our archaeological sites can be protected neither by the police nor by archaeologists, for even their combined numbers are still significantly less than the potential offenders, and they naturally have other responsibilities. In the long-term perspective, the only protective force that can protect archaeological monuments is an informed public that understands its surroundings and appreciates their value. We believe that those who want to intentionally damage archaeological sites already know where to find them. However, it is truly ironic that those sites are not known to people who live in their vicinity and who may in fact be willing to protect them if they were endangered (of course, not on their own but by quickly informing the appropriate public authorities). It is precisely this paradox that the Archaeological Atlas is trying to correct, at least to a certain degree. The second point is also intentional and stems from the authors' research paradigm. The authors deliberately aim to advocate archaeological monuments of modernity as a meaningful field of study. Although this line of research has already been established and is systematically developed at some institutions (e.g. at the Department of Archaeology of the University of West Bohemia in Pilsen or at the Faculty of Humanities of the Charles University in Prague), it has not yet fully penetrated into public consciousness. For example, a standard (and, in many situations, successful) excuse of metal-detector users is that they are not seeking archaeological finds, but just the remains from World War II. However, even these remains belong to the field of archaeology, and not only for reasons of consistency of research concepts. They belong there primarily because they contain interesting information about the past, and we may only regret that they are disappearing so quickly. Finally, yet importantly, the Atlas also offers foreign visitors educational information about Czech archaeological monuments, mainly with the fairly extensive English summary with an abstract for each site and translations of the map captions and legends, as well as the full English version of the website (see above; Figure 10). 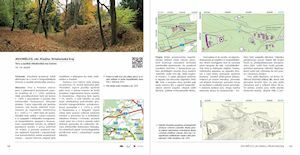 Strictly speaking, this is the first systematic information for those travelling through Bohemia without a predetermined target in mind, but who intend to learn about the local archaeological heritage. The fundamental courses for any future development in the field of 'digital archaeology' include ensuring broader public application of archaeological data, multidisciplinary approaches, integration into the international environment, dependency limitation on service providers, implementation of international standards, Open Source as well as Open Access concepts, and, mainly, creative infrastructure utilisation in the field of research as well as archaeological heritage management. The authors believe that the development of archaeological information sources in the CR should aim at the integration of departmental information systems both in terms of data connectivity and user interfaces in order to design and deliver these data with common heuristic and analytic tools. These efforts should result in the creation of a unified virtual research environment (VRE). A qualitative shift can occur in Czech archaeology only if the approach to processing primary data is fundamentally changed. The quantity of commonly processed data should increase along with their accessibility; the variety of analytical procedures and tools should expand and, last but not least, fundamental theoretical and methodological concepts should be codified. Further development of archaeological e-infrastructures will lead to the direct involvement of IT specialists in scientific projects and, at the same time, the strengthening of similar competencies of professional archaeological staff will be also supported. We are currently facing a situation in which information science in archaeology is not only the concern of archaeologists but also technically orientated professionals with an interdisciplinary overlap. In a longer perspective, it will probably become standard procedure to employ software developers in the academic institutions. Moreover, it will be necessary for such specialists to have direct insight into archaeology and a close mutual cooperation within the scope of joint multidisciplinary teams. The decisive factors in creating e-infrastructures, among other things, are the stipulation of licensing terms, the editing of user rights as well as arrangements applied for the sharing and secondary application of the content. One of the most important problems hindering the development of existing digital services appears to be a dependency on particular software providers, their competence to meet the needs of research infrastructures as well as the long-term sustainability of the resulting solutions. The application of Open Source concepts can provide an answer to these as well as other challenges. Software based on the Open Source code is open both in terms of accessibility and licences for sharing and changing. Thus, its further development is independent of the original suppliers and there are no problems regarding its replication in other systems. Data provided within the scope of e-infrastructures are protected in the same way as the software itself. Currently, Czech archaeology suffers in this respect by a certain vacuum stemming from (i) the ill-defined relationships between the providers and the data administrators and (ii) the application of common copyright law protection instead of specifically defined licensing terms. The general intention is, however, providing the largest possible amount of research data to the general public for use and distribution in the Open Access mode. This approach manifests itself in an increase in freely available digital resources. Research data should be understood as a product of public service and their withholding cannot be rationally based, as it only burdens the academic environment. The integration and interoperability of digital resources requires not only the coordination of the activities of institutions involved in building common information systems, but also the establishment of long-term existing rules and regulations that allow orientation within the data and metadata. The aim is to unite the data models of the related but still independent systems in such a way that the extraction of information will not require any additional user intervention, but will proceed on a semiautomatic or fully automated level. To achieve this goal, nationally and mainly internationally recognised standards need to be applied; their observance helps to streamline the digital space. The standards can be applied in two ways: either by building the system directly on the basis of the standard, or by utilising specific tools for mapping the data classes into standard forms. 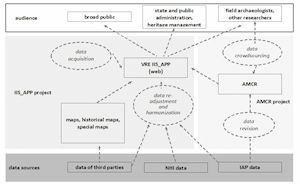 Standardisation is one of the key pillars of data integration in heritage management, promoting networking services and content that can be very heterogeneous. At the same time, standardisation encourages the creation and growth of catalogue and aggregation services that combine independently generated data, open up new possibilities for the comparative study of different datasets, and, thanks to uniform semantics, reduce the impact of language barriers. While the AMCR system was built to include basic components of international standards (e.g. Dublin Core), it will be necessary to establish new procedures for mapping individual schemes within the framework of the planned public API. The standardisation of outputs mainly in the form of machine-readable data represents a task that requires the further conceptual development of the system. The rapid spread and efficiency of the CIDOC-CRM reference model shows that in the course of the development of the branch infrastructures, standardisation will necessarily have to come into focus. While looking at the complex system and immense volumes of information and considering the development of digital infrastructures we are inevitably led to ponder how much information escapes our current scope. Unquestionably, it is a problem we have tried to solve for years, but it was only the complex approach and the insight (that could never be achieved in the analogue environment) that has revealed the wide range of topics whose solution represents a task for the coming years. These problems were caused by the methods of existing evidence systems, their historical and regionally conditioned development as well as by the nature of archaeology, management systems, institutional arrangements of archaeological fieldwork, selective access to the data, division of competences, technical capabilities, varying funding and other numerous aspects that influence the creation and management of archaeological archives. Developing the idea of a unified platform is anchored in an attempt to reduce the information-loss rate within archaeological fieldwork as well as to ensure a stable position for Czech archaeology in an interdisciplinary and international environment. However, this path also envisages the development of new competencies among archaeologists, notably in the field of digital resources management. The contextualisation through data and resources built on alternative source evidence is a task that is as equally important as the collection of old and the creation of new archaeological data. 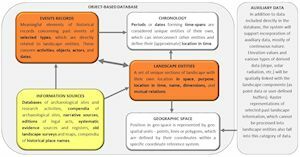 Written historical records of a narrative and official nature, describing the past landscape independently using archaeological evidence as well as the distribution of human activity areas, represent a natural source of information that has not been significantly and systematically exploited in the CR so far. A significant amount of critical editions of historical documents that have already been published over the last two centuries, especially for the earlier part of the Middle Ages, have covered most relevant sources for the territory of the CR and may serve as a good starting point to meet such a goal. The problem with this group of sources lies, of course, in the different level of editorial practice and editorial apparatus (e.g. local and data indexes, etc.) and the almost complete absence of efforts to present the data in a spatial manner. In this respect, it is necessary to perform a great deal of methodological work that will be followed up by a demanding retrieval of structured data from various sources (Figure 11). With the exception of securing the infrastructure itself, system management and data collection, it is crucial for any further development to offer utilities that will be helpful (1) in the course of theoretical research; (2) as methodological and practical support for archaeological data collection; and (3) as an efficient tool for data analysis. The fulfilment of these tasks is an ongoing and never-ending process that will actually react to and ideally also anticipate the needs of the target groups as well as the professional environment as a whole. However, none of these approaches can be meaningfully applied without enough quality data collected by a uniform method. Data acquisition is time-consuming and the most personnel-demanding phase of building an archaeological infrastructure. Thus, it cannot be assumed that one organisation or any of its working groups will be able to consistently cover this activity institutionally or even just within the scope of short-term projects. A temporary suspension or interruption of the data collection process will always result in inconsistency, and retrospective filling of the database is usually very difficult. For this reason, it is necessary to lay the weight of data acquisition upon the whole community of users (data consumers), i.e. to apply a kind of crowdsourcing principle. 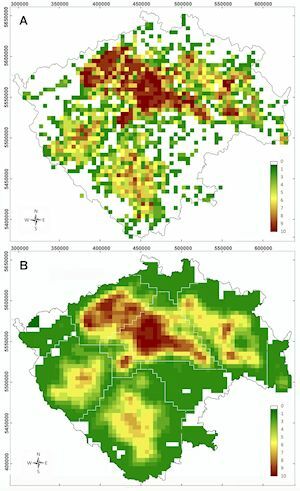 The concept should cover as many areas as possible, especially considering the huge increase in data collected by the uncoordinated application of remote sensing, the need to process the as yet non-digitised lists and surveys (published and unpublished) and the need to initiate intensive cooperation in the integration of interdisciplinary data. Data sharing by the whole community also represents an extremely valuable opportunity to professionally engage amateur archaeologists, mainly the users of metal detectors. Unlike a special-purpose information system, the creation of infrastructures is only meaningful in the long-term perspective. This aspect should also be reflected in the significance given to such tasks in the evaluation of professional institutions engaged both in theoretical and applied research (i.e. heritage management in the case of archaeology). On the other hand, research infrastructures need to be understood as an integral and necessary part of the cycle of scientific cognition, not as its alternative. They are a welcome tool, not a goal in and of themselves. This article was prepared as a result of the project Archaeological Information System of the Czech Republic (AIS CR; LM2015080). It is a comprehensive summary of selected chapters of the book Structuring Archaeological Evidence: The Archaeological Map of the Czech Republic and related information systems published by authors (Kuna et al. 2015). Brown, D.H. 2007 Archaeological archives. A guide to best practice in creation, compilation, transfer and curation, London: Archaeological Archives Forum. Dreslerová, D. 2011 Přírodní prostředí a pravěké zemědělské společnosti (na území Čech) [Environment and prehistoric agricultural societies (in Bohemia)], Doctoral thesis, Charles University, Prague. Dreslerová, D. and Demján, P. 2015 'Application of AMCR data in the study of prehistoric settlement patterns' in M. Kuna, J. Hasil, D. Novák, I. Boháčová, L. Čulíková, P. Demján, D. Dreslerová, M. Gojda, I. Herichová, D. Křivánková, O. Lečbychová, J. Mařík, J. Maříková-Kubková, M. Panáček, J. Podliska, A. Pokorná, J. Řihošek, E. Stuchlíková, M. Suchý, J. Válek, N. Venclová and L. Haišmanová (eds) Structuring archaeological evidence: The Archaeological Map of the Czech Republic and related information systems, Prague: Institute of Archaeology CAS. 141–61. Dreslerová, D., Kočár, P. and Chuman, T. 2016 'Pravěké osídlení, půdy a zemědělské strategie [Prehistoric societies, soils and agricultural strategies]', Archeologické rozhledy 68, 19–46. Gaffney, V. & Tingle, M. 1984 'The tyranny of the site: method and theory in field survey [off-site land use]', Scottish Archaeological Review 3, 134-40. Kuna, M. 1991 'Návrh systému evidence archeologických nalezišť [A proposal for an information system of archaeological sites]', Archeologické fórum 2, 25-48. Kuna, M. 1994 'State archaeological database', Památky archeologické – Supplementum 1, 221-28. Kuna, M. 2002 'The Bohemian archaeological record. An attempt at an analytical information system' in L.G. Sanjuán and D. Wheatley (eds) Mapping the Future of the Past. New information technologies for managing the European archaeological heritage, Sevilla: Universidad de Sevilla. 45-52. Kuna, M. and Křivánková, D. 2006 ARCHIV3.0. Systém Archeologické databáze Čech. Uživatelská příručka [ARCHIVE 3.0. 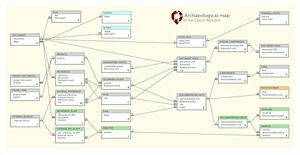 System of the Archaeological Database of Bohemia. User Manual], Praha: Institute of Archaeology CAS. Kuna, M. (ed) Brůžek, J., Černý, V., Dreslerová, D., Hájek, M., Horáček, I., Kráčmarová, A., Likovský, J., Neustupný, E., Pokorný, P., Stránská, P., Šmahel, Z., Urbanová, M., Vařeka, P., Velemínský, P., Nývlt, D., Pleinerová, I. and Světlík, I. 2007 Archeologie pravěkých Čech 1. Pravěký svět a jeho poznání [Archaeology of the Prehistoric Bohemia 1. Prehistoric world and its cognition], Praha: Institute of Archaeology CAS. Kuna, M., Danielisová, A., Dreslerová, D., Hasil, J., Hložek, J., Langová, M., Mařík, J., Novák, D., Čišecký, Č., Kačerová, Z., Čepeláková, E., Korteová, J., Křivánková, D., Maříková Vlčková, P., Mazač, Z. and Říhová, J. 2014/2015 Archeologický atlas Čech. Vybrané památky od pravěku do 20. století [Archaeological atlas of Bohemia. 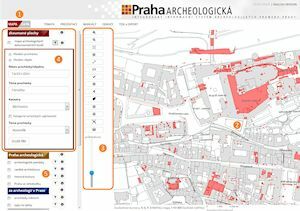 Selected sites from prehistory to the 20th century], Praha: Institute of Archaeology CAS – Academia. 1st edn (2014), 2nd edn (2015). Kuna, M., Hasil, J., Novák, D., Boháčová, I., Čulíková, L., Demján, P., Dreslerová, D., Gojda, M., Herichová, I., Křivánková, D., Lečbychová, O., Mařík, J., Maříková-Kubková, J., Panáček, M., Podliska, J., Pokorná, A., Řihošek, J., Stuchlíková, E., Suchý, M., Válek, J., Venclová, N. and Haišmanová, L. 2015 Structuring archaeological evidence: The Archaeological Map of the Czech Republic and related information systems, Prague: Institute of Archaeology CAS, Prague, v.v.i. Neustupný, E. 1986 'Sídelní areály pravěkých zemědělců [Settlement areas of prehistoric farmers]', Památky archeologické 77, 226-34. Niederle, L. 1919 'Před novými úkoly', Památky archeologické 31, 1-2. Perrin, K., Brown, D.H., Lange, G., Bibby, D., Carlsson, A., Degraeve, A., Kuna, M., Larsson, Y., Pálsdóttir, S.U., Stoll-Tucker, B., Dunning, C., Rogalla von Bieberstein, A. 2014 The Standard and Guide to Best Practice in Archaeological Archiving in Europe, Namur: Europae Archaeologiae Consilium (EAC Guidelines 1). Pokorný, P. 2011 Neklidné časy. Kapitoly ze společných dějin přírody a lidí [Restless times. Chapters from the common history of nature and men], Praha: Dokořán.